As I was preparing this piece, virtual-paging through 26 years’ worth of reviews of Paul McAuley’s work, I recognized (again) how his stories refuse to drop neatly into single categories – they like to squirm out of whatever boxes they’re stuffed into and find their own shapes. What remains stable is the sharp ob­servation of each imagined world, whether it’s an alternate Florentine Renaissance, a cyberpunkish near-future Europe, a Chinese-colonized Mars, or a settled and industrialized asteroid belt. 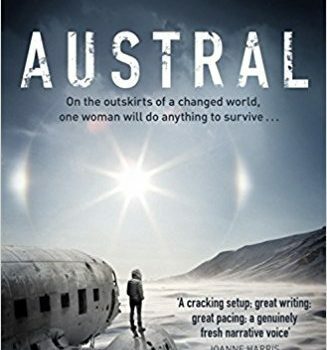 His new novel, Austral, is no exception. It is set in the same future as “Elves of Antarctica” (published in last year’s Drowned Worlds: Tales from the Anthropocene and Beyond, edited by Jonathan Strahan), but about 50 years later. Ant­arctica (like the rest of the planet) is still warming, and its least hostile parts continue to be settled, developed, and exploited. The continent is now governed by the same kind of power elites whose business-as-usual policies contributed to global ecological disruption, and the ecopoets who first followed the receding ice, spreading genetically adapted plants and animals, building refuges, and occasionally erecting Tolkienesque elf stones, have long since been suppressed, co-opted, out­lawed, rounded up, or pushed into the outback. The book opens as a prison drama. The narra­tor, labor camp guard Austral Ferrado, is drafted by star inmate Keever Bishop into an elaborate escape scheme that will use a visiting politician (who is also Austral’s estranged uncle) to provide a distraction. There is another complication: Austral is not only in Bishop’s employ, she is his lover, pregnant with his child – a fact she has not revealed to him. The plan goes awry when Austral discovers and disrupts Bishop’s minions as they attempt to kidnap the politician’s 13-year-old daughter Kamilah – Austral’s cousin. 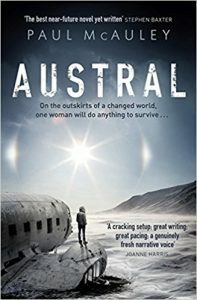 Austral has been an outsider from birth: a genetically modified “husky” adapted for the still-harsh Antarctic climate, a product of the repudiated ecopoet culture, and part of a despised and repressed underclass. She knows that others see her as a monster, “a hulking troll got up from seal leather and patches of yak fur, the cruel cap­tor of a fair maiden I’d lured to my underground lair.” She comes from a family with a history of defying the authorities and lighting out for the territories, often with someone in pursuit, so it’s in character for her to rescue and/or kidnap Kamilah (depending on one’s point of view) and head for the back country. From there the story shifts to a wilderness adventure as the pair flee with the authorities and Bishop’s bravos in pursuit, on a route that takes them and us on a tour through both the wild and developed-and-abandoned portions the Antarctic Peninsula, and provides glimpses of the continent’s recent history. [T]his is my account of what happened and why, as true as I can tell it. It’s your story, too. The story of how you came to be. How I tried to save you. And it’s the story of our family and the story of the peninsula, wound around each other like the rose and the briar…. The result is a book is full of embedded nar­ratives. 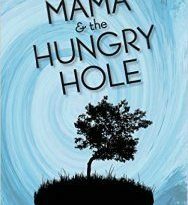 Austral recounts her childhood in the boondocks among the outlawed ecopoets and later in state orphanages and as a petty criminal. It also reaches back to the story of her solitary, angry mother, and to the history of her sociopathic grandfather’s abandonment of his family and community and his rise to wealth and influence – all the layers of betrayal and corruption that led to the splitting of her family tree and her absconding with Kamilah. The chapters with the accounts of Austral’s grandparents’ lives have titles instead of numbers: “The Ballad of Isabella and Eddie”, “Drugs, Guns, and Money”, and “Eddie Pulls a Fast One”. Another named chapter, “The Happi­est Days of My Life”, recalls a period of freedom when Austral and her mother were fugitives, living off the land and undoing the too-regular results of commercial cultivation. wild and strange, a complex web that discov­ered its own checks and balances as it was pushed and pulled by fluctuations of climate and the keystone species. A great work of time that couldn’t be quantified in terms of profit, utility, or any other human measure except, maybe, beauty. McAuley is a subcreator of such worlds and of fictions that model and mimic them, at once or­derly and surprising, intelligible and mysterious.